HỘI AN — The appearance of a 15ha sandbank, 1.8km off the Cửa Đại Beach since early this year offers a chance to research changing riverhead flows and sand sedimentation at lower lands, according to experts. The emergence of the sandbank could lead to solutions to help save Cửa Đại Beach, 5km from UNESCO-recognised world heritage site Hội An City, from serious erosion over past decades. Representatives of central Quảng Nam Province and the Ministry of Natural Resources and Environment, in co-operation with experts from the Netherlands, surveyed the sandbank on Thursday, and scientific seminars will be held in the coming time to seek solutions to stop the erosion of Cửa Đại Beach. Vice Chairman of Hội An people’s committee, Nguyễn Thế Hùng, said the city and the central natural disaster prevention agency would set up an observation system on the sandbank within the next year. Hùng said effective solutions on stopping beach erosion will be based on scientific conclusions on the riverhead flow and sand sediment process. According to Quảng Nam Province, the sandbank developed due to the Thu Bồn River system and was badly affected by climate change as well as a rising sea level. Experts said the sandbank, 1km long and 200m wide, was 2m higher than sea level, and grass was found growing on the sand. They said sand sediment possibly kept moving southward of Cửa Đại Beach in the area of Duy Hải Commune of Duy Xuyên Province. Cửa Đại Beach, one of the most beautiful beaches in Hội An, has been eroded on a section of 8km from 2004, in which a 3km section is seen as serious and will wash away soon. 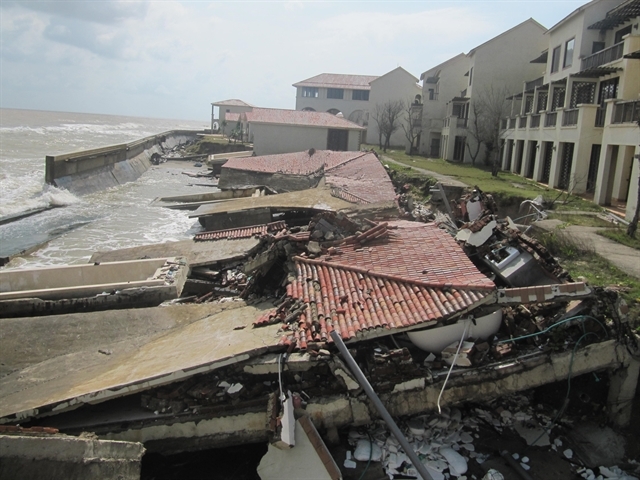 Experts said the beach erosion partly resulted from the development of 33 beach resorts on a 62km coast line from Tiên Sa Beach (in Đà Nẵng) to Quảng Nam. The rapid building of 42 hydro-power plants on the riverhead system in Quảng Nam also prevented sand sedimentation at lower river areas. The province built up a 1.3km concrete dyke system, Geotube sandbag dyke and 70,000cu.m of sand and sludge filling up the beach to protect the coast from damage. A latest report from the city showed that 20ha of public beach has been washed away due to rising sea levels and changes to the river flow in the Thu Bồn River estuary since 2013. Hội An and the Agency for Development of France (AFD) conducted a survey of beach nourishment of Cửa Đại in 2018. French-Vietnamese architect Bùi Kiến Quốc blamed the erosion on the construction of resorts on the beach and the lack of proper environmental assessments before dredging the Thu Bồn estuary. The city has been seeking funds to replant 140ha of Nipa palm (a species of palm native to the coastlines) along the Thu Bồn River to reduce sand erosion in Cửa Đại beach.